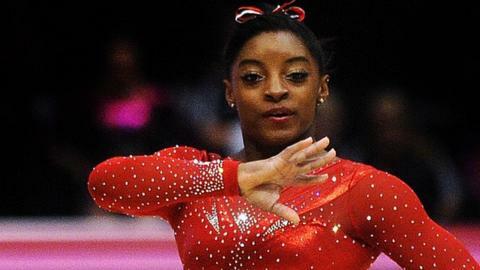 Simone Biles won an unprecedented third successive individual all-around World Championship gold medal in Glasgow. She scored 60.388 points, ahead of Olympic champion and fellow American Gabrielle Douglas (59.305) and Romania's Larisa Iordache (59.100). Biles, 18, told BBC Sport: "I don't have words to describe it. I just keep blowing my own mind." Great Britain's Ruby Harold (54.699) and Amy Tinkler (54.098) were 22nd and 23rd respectively. Douglas was competing at the highest level for the first time since winning gold at London 2012. Russia's Svetlana Khorkina also won three world titles, but not in succession.